TwitterFederal authorities on Friday arrested a man in connection with a slew of attempted attacks on top Democrats and other public figures. Federal authorities have arrested a man in Florida in connection with a series of attempted attacks on top Democrats and other public figures this week. A spokeswoman for the Department of Justice confirmed that a suspect was in custody. The suspect’s name is Cesar Sayoc Jr., NBC News and the Miami Herald reported, citing law-enforcement sources. At least 14 suspicious packages have been intercepted since Monday. All were addressed or sent to top Democrats and other public figures whom President Donald Trump has vocally attacked and who’ve often been critical of the president. Federal authorities have arrested a man in Florida in connection with a series of attempted attacks on top Democrats and other public figures over the course of the week. 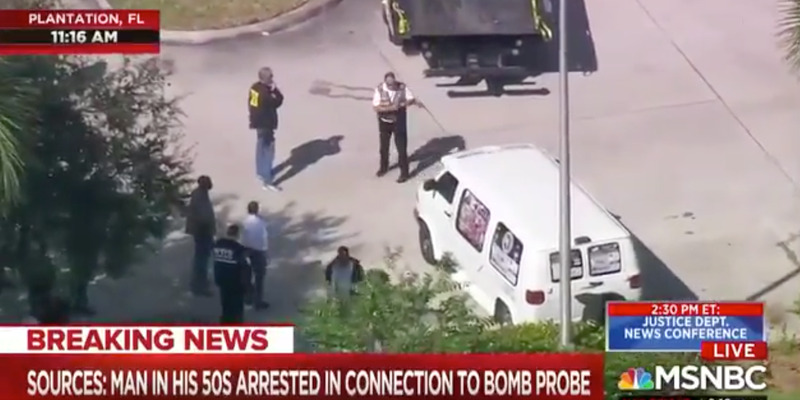 The suspect is Cesar Sayoc Jr., 56, from Aventura, Florida,NBC News and the Miami Herald reported, citing law-enforcement sources. Sayoc was arrested around 10 a.m. ET on Friday at an AutoZone in Plantation, Florida, and is being questioned by FBI agents with the Joint Terrorism Task Force, according to reports. A spokeswoman for the Department of Justice also confirmed that a suspect was in custody and said a press conference was scheduled for 2:30 p.m.
Sayoc is expected to face charges in connection with the suspicious packages. Sayoc, a registered Republican, has an extensive criminal history, including a 2002 arrest on charges that he made a bomb threat, according to reports from The New York Times and The Washington Post. It’s not clear whether anyone else may have been involved in the attempted attacks. Police in Plantation also towed a van that appears to be connected to the arrest, according to reports. At least 14 suspicious packages containing what authorities described as explosive devices have been intercepted since Monday. All were addressed or sent to top Democrats and other public figures whom Trump has vocally attacked and who’ve often been critical of the president. 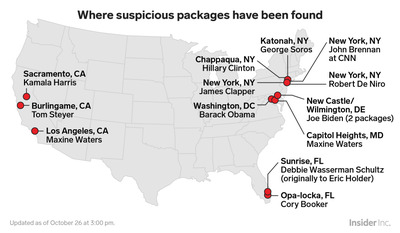 So far, packages have been sent or addressed to former President Barack Obama, former Secretary of State Hillary Clinton, former CIA Director John Brennan, former Attorney General Eric Holder, Democratic Rep. Maxine Waters, former Vice President Joe Biden, the actor Robert De Niro, Democratic Sen. Cory Booker, former Director of National Intelligence James Clapper, Democratic Sen. Kamala Harris, Democratic donor Tom Steyer, and the billionaire Democratic donor George Soros. Gureghian said that Sayoc’s comments about LGBTQ people and African-Americans worried his coworkers..